Whether it’s recruiting people to sell so-called Internet-access devices, placing kiosks with Internet access in public places, or dealing in other Internet-related activities, consumers are being lured to the vast commercial potential of the Web by business promoters. However, the Federal Trade Commission (FTC) says that many of these business opportunities are scams that promise more than they can possibly deliver. The scam artists lure would-be entrepreneurs with false promises of big earnings for little effort. They pitch their fraudulent offerings on the Web; in e-mail solicitations; through infomercials, classified ads and newspaper and magazine “advertorials”; and in flyers, telemarketing pitches, seminars, and direct-mail solicitations. The Pitch: The promoter promises that you can earn thousands of dollars a month by recruiting people to sell devices that provide television access to the Internet. The Problem: The program claims to pay participants based on how many people they recruit into the program, not on their product sales. That makes the program a pyramid scheme – not a legitimate multi-level marketing plan. Pyramid schemes are illegal. Mathematically, nearly everyone who participates in them loses their money. When there are no new recruits, the pyramid collapses. The Pitch: The promoter claims you can earn big money by selling machines or kiosks that provide walk-up Internet access – for a fee – in places like airports, hotels and shopping malls. The machines cost thousands of dollars, but the promoter says the cost can be recovered because the machines generate “amazing” earnings. And, the company promises to help find profitable locations for the machines. The Problem: Rather than the high-traffic locations that the promoter promises, the buyer’s machines get placed where demand for Internet access is low. As a result, a would-be entrepreneur can’t possibly make the promised earnings. The Pitch: The promoter advertises that you can earn more than $150,000 as an “Internet consultant” who sponsors free seminars to teach other consumers how to make money on the Internet. The Problem: The seminars really feature high-pressure sales pitches for the promoter’s Internet yellow pages or Internet advertising. And, even though the promoter promises to provide Internet and sales training to buyers – for a fee of several thousand dollars – the buyers never get the promised training. In the end, they never earn the promised amounts. Consider the promotion carefully. If it claims buyers can earn a certain income, then it also must give the number and percentage of previous purchasers who achieved the earnings. If an earnings claim is there – but the additional information isn’t – the business opportunity seller is probably violating the law. Get earnings claims in writing. If the business opportunity costs $500 or more, then the promoter must back up the earnings claim in a written document. It should include the earnings claim, as well as the number and percentage of recent clients who have earned at least as much as the promoter suggested. If it’s a work-at-home or other business opportunity that involves an investment of under $500, ask the promoter to put the earnings information in writing. Study the business opportunity’s franchise disclosure document. Under the FTC Franchise Rule, many business opportunity promoters are required to provide this document to potential purchasers. It includes information about the company, including whether it has faced any lawsuits from purchasers or lawsuits alleging fraud. Look for a statement about previous purchasers. If the document says there have been no previous purchases but the seller offers you a list of references, be careful: the references probably are phonies. Interview each previous purchaser in person, preferably where their business operates. The FTC requires most business opportunity promoters to give potential purchasers the names, addresses and phone numbers of at least 10 previous purchasers who live the closest to the potential purchaser. Interviewing them helps reduce the risk of being misled by phony references. Contact the attorney general’s office, state or county consumer protection agency and Better Business Bureau both where the business opportunity promoter is based and where you live to find out whether there is any record of unresolved complaints. While a complaint record may indicate questionable business practices, a lack of complaints doesn’t necessarily mean that the promoter and the business opportunity don’t have problems. Unscrupulous dealers often change names and locations to hide a history of complaints. If the business opportunity involves selling products from well-known companies, call the legal department of the company whose merchandise would be promoted. Find out whether the business opportunity and its promoter are affiliated with the company. Ask whether the company has ever threatened trademark action against the business opportunity promoter. Consult an attorney, accountant or other business advisor before you put any money down or sign any papers. Entering into a business opportunity can be costly, so it’s best to have an expert check out the contract first. If the promoter requires a deposit, ask your attorney to establish an escrow account where the deposit can be maintained by a third party until you make the deal. Take your time. Promoters of fraudulent business opportunities are likely to use high-pressure sales tactics to get you to buy in. If the business opportunity is legitimate, it’ll still be around when you’re ready to decide. The Internet has taken its place beside the telephone and television as an important part of people’s lives. Consumers use the Internet to shop, bank and invest online. Most consumers use credit or debit cards to pay for online purchases, but other payment methods, like “e-wallets,” are becoming more common. The Federal Trade Commission (FTC) wants you to know about these payment technologies and how to make your transactions as safe and secure as possible. Keep these tips in mind as other forms of electronic commerce, like mobile and wireless transactions, become more available. Most online shoppers use credit cards to pay for their online purchases. But debit cards – which authorize merchants to debit your bank account electronically – are increasing in use. Your debit card may be an automated teller machine (ATM) card that can be used for retail purchases. To complete a debit card transaction, you may have to use a personal identification number (PIN), some form of a signature or other identification, or a combination of these identifiers. Some cards have both credit and debit features: You select the payment option at the point-of-sale. But remember, although a debit card may look like a credit card, the money for debit purchases is transferred almost immediately from your bank account to the merchant’s account. In addition, your liability limits for a lost or stolen debit card and unauthorized use are different from your liability if your credit card is lost, stolen or used without your authorization. Other electronic payment systems – sometimes referred to as “electronic money” or “e-money” – also are now common. Their goal is to make purchasing simpler. For example, “stored-value” cards let you transfer cash value to a card. They’re commonly used on public transportation, at colleges and universities, at gas stations, and for prepaid telephone use. Many retailers also sell stored-value cards in place of gift certificates. Some stored-value cards work offline, say, to buy a candy bar at a vending machine; others work online, for example, to buy an item from a website; some have both offline and online features. Some cards can be “reloaded” with additional value, at a cash machine; other cards are “disposable” – you throw them away after you use all their value. Some stored-value cards contain computer chips that make them “smart” cards: These cards may act like a credit card as well as a debit card, and also may contain stored value. Some Internet-based payment systems allow value to be transmitted through computers, sometimes called “e-wallets.” You can use “e-wallets” to make “micropayments” – very small online or offline payments for things like a magazine or fast food. When you buy something using your e-wallet, the balance on your online account decreases by that amount. “E-wallets” may work by using some form of stored value or by automatically accessing an account you’ve set up through a computer system connected to your credit or debit card account. The FTC encourages you to take steps to make sure your transactions are secure and your personal information is protected. Although you can’t control fraud or deception on the Internet, you can take action to recognize it, avoid it and report it. Here’s how. Use a secure browser – software that encrypts or scrambles the purchase information you send over the Internet – to help guard the security of your information as it is transmitted to a website. Be sure your browser has the most up-to-date encryption capabilities by using the latest version available from the manufacturer. You also can download some browsers for free over the Internet. When submitting your purchase information, look for the “lock” icon on the browser’s status bar, and the phrase “https” in the URL address for a website, to be sure your information is secure during transmission. Read and understand the refund and shipping policies of a website you visit, before you make your purchase. Look closely at disclosures about the website’s refund and shipping policies. Again, search through the website for these disclosures. Keep your personal information private. Don’t disclose your personal information – your address, telephone number, Social Security number, bank account number or e-mail address – unless you know who’s collecting the information, why they’re collecting it and how they’ll use it. Give payment information only to businesses you know and trust, and only when and where it is appropriate – like an order form. Never give your password to anyone online, even your Internet service provider. Do not download files sent to you by strangers or click on hyperlinks from people you don’t know. Opening a file could expose your system to a computer virus or a program that could hijack your modem. Keep records of your online transactions and check your e-mail for contacts by merchants with whom you’re doing business. Merchants may send you important information about your purchases. Review your monthly credit card and bank statements for any errors or unauthorized purchases promptly and thoroughly. Notify your credit or debit card issuer immediately if your credit or debit card or checkbook is lost or stolen, or if you suspect someone is using your accounts without your permission. credit charges or electronic fund transfers for which you request an explanation or documentation, because of a possible error. For credit: The FCBA generally applies to “open end” credit accounts – that is, credit cards and revolving charge accounts, like department store accounts. It does not apply to loans or credit sales that are paid according to a fixed schedule until the entire amount is paid back, like an automobile loan. Lost or stolen credit cards: Under the FCBA, your liability for lost or stolen credit cards is limited to $50. If the loss involves only your credit card number (not the card itself), you have no liability for unauthorized use. It’s best to notify your card issuer promptly upon discovering the loss. Many companies have toll-free numbers and 24-hour service to deal with such emergencies. Always follow up with a letter and keep a copy for your records. Billing errors: The FCBA’s settlement procedures apply to disputes about “billing errors” for open-end accounts, including unauthorized charges (you cannot be liable for more than $50 for unauthorized credit charges); charges for goods or services you didn’t accept or weren’t delivered as agreed; charges that are incorrectly identified or show the wrong amount or date; math errors; a failure to properly reflect payments or credits; not mailing or delivering credit billing statements to your current address, if the address was received by the creditor in writing at least 20 days before the billing period ended; and charges for which you request an explanation or documentation, because of a possible error. To take advantage of the FCBA’s consumer protections for errors on your account, write to the creditor at the address given for “billing inquiries,” not the address for sending your payments. Include your name, address, account number and a description of the billing error. Send your letter so that it reaches the creditor within 60 days after the first bill containing the error was mailed to you. And if you send your letter by certified mail, return receipt requested, you’ll have proof that the creditor received it. Include copies (not originals) of sales slips or other documents that support your position. Keep a copy of your dispute letter. The creditor must acknowledge your dispute in writing within 30 days after it is received, unless the problem is resolved within that period. The creditor must con-duct an investigation and either correct the mistake or explain why the bill is believed to be correct, within two billing cycles (but not more than 90 days), unless the creditor provides a permanent credit instead. You may withhold payment of the amount in dispute and any related finance charges and the creditor may not take any action to collect that amount during the dispute. For debit: The EFTA applies to electronic fund transfers – transactions involving automated teller machines (ATMs), debit cards and other point-of-sale debit transactions, and other electronic banking transactions that can result in the withdrawal of cash from your bank account. Lost or stolen debit cards: If someone uses your debit card, or makes other electronic fund transfers, without your permission, you can lose from $50 to $500 or more, depending on when you report the loss or theft. If you report the loss within two business days after you discover the problem, you will not be responsible for more than $50 for unauthorized use. However, if you do not report the loss within two business days after you realize the card is missing, but you do report its loss within 60 days after your statement is mailed to you, you could lose as much as $500 because of an unauthorized withdrawal. And, if you do not report an unauthorized transfer or withdrawal within 60 days after your statement is mailed to you, you risk unlimited loss. That means you could lose all the money in your account and the unused portion of your maximum line of credit established for overdrafts. Some financial institutions may voluntarily cap your liability at $50 for certain types of transactions, regardless of when you report the loss or theft; because this is voluntary, their policies could change at any time. Ask your financial institution about its liability limits. electronic fund transfers for which you request an explanation or documentation, because of a possible error. To take advantage of the EFTA’s error resolution procedures, you must notify your financial institution of the problem not later than 60 days after the statement containing the problem or error was sent. Although most financial institutions have a toll-free number to report the problem, you should follow-up in writing. For retail purchases, your financial institution has up to 10 business days to investigate after receiving your notice of the error. The financial institution must tell you the results of its investigation within three business days of completing its investigation. The error must be corrected within one business day after determining the error has occurred. If the institution needs more time, it may take up to 90 days, in many situations, to complete the investigation – but only if it returns the money in dispute to your account within 10 business days after receiving notice of the error, while it reviews your concerns. For stored-value: The FCBA and the EFTA may not cover stored-value cards or transactions involving them, so you may not be covered for loss or misuse of the card. However, stored-value cards still might be useful for micropayments and other small purchases online because they can be convenient and – in some cases – offer anonymity. Before you buy a stored-value card or other form of e-money, ask the issuer for written information about the product’s features. Find out the card’s dollar limit, whether it is reloadable or disposable, if there’s an expiration date, and any fees to use, reload or redeem (return it for a refund) the product. At the same time, ask about your rights and responsibilities. For example, does the issuer offer any protection in the case of a lost, stolen, misused, or malfunctioning card, and who do you call if you have a question or problem with the card? Your financial institution, local consumer protection agency and law enforcement agencies like the Federal Trade Commission or your state Attorney General are among the many organizations working to help consumers understand electronic commerce and new online payment options. The Internet is an exciting tool that not only puts vast information at your fingertips but expands your shopping options like never before. Now, with only a few clicks of a mouse, you can go online to buy just about anything you need or want – from airline tickets to rare antiques. Whether you’re buying direct from a business or an individual, an online “retailer” or an Internet auction, shopping online can be fun, easy, practical, and economical. But, just as in the bricks and mortar world, the Internet shopping experience can be marred with unscrupulous dealers constantly devising new ways to deceive consumers out of their money. This site offers information to help you shop safely and wisely online. You can learn, for example, how to use online payment services, participate in an Internet auction or resolve a complaint with an online dealer. If you’re a seller, you can learn about the FTC’s rules for online advertising, timely deliveries and other business-related matters. So come on in. Take a good look around. You’re sure to find some important advice you can take with you on your next online shopping trip. Shopping online opens up a world of opportunity, convenience, choice, competitive prices and information. But what should you do if something goes wrong with your purchase? What if you don’t get the products you ordered? What if they arrive damaged? What if you have been unable to resolve your problem by contacting the business directly? Although the legal remedies available to you may vary depending on your country, the following links may offer a quick and inexpensive way for you to resolve your complaint without having to initiate a formal legal action. If you paid with a payment card (such as a credit card, debit card, stored value card, etc. ), in some cases there may be some protection or relief available to you through the payment card issuer. There are several alternative ways to resolve your complaint through an independent third party, without having to file a claim in court. These methods can be much quicker and less expensive. On January 12, 2010, an earthquake devastated much of Haiti’s capital and other regions, leaving some 200,000 dead and over a million homeless. Foreign governments, agencies and citizens from around the world showed their solidarity by pledging billions of dollars. Contractors, “non-profits,” “NGOs” and church groups rushed in and got to work – sometimes on projects called for my local citizens and government authorities, but sometimes not. The foreign media also rushed in… and then rushed out. Nobody stayed behind to watchdog the cash being spent in the name of “reconstruction” and “development.” Haiti’s press has little tradition of investigative journalism. Also, the powerful local outlets – run by the government and by wealthy businesspeople – have little interest in digging too deep, since they often profit, even as hundreds of thousands of earthquake victims are left out in the cold and rain. Literally. As of January 12, 2013, the third anniversary of the tragedy, some 400,000 people were still living in squalid tent camps. Ayiti Kale Je, meaning “Haiti Eyes Peeled” or “Haiti Grassroots Watch” in English, came together to address need for accountability. Over the past 28 months, this partnership of community radio station members, journalists and university journalism students have exposed corruption and waste as well as the cynical way in which at least some “aid” is carried out – with no input from Haiti’s poorest, the supposed beneficiaries. Among other discoveries, Ayiti Kale Je has also: • Uncovered the fact that Canadian and US companies control a massive part of Haiti’s mineral rights, • Exposed the ugly underbelly of “cash for work” programs, • And laid bare a cynical housing “exposition” sponsored in part by Bill Clinton. 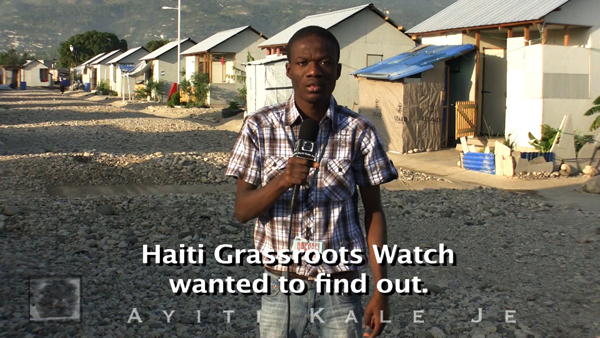 By combining the best of grassroots reporting from farmers and coffee growers, careful research from students, and hard-hitting analysis from the Haitian journalists overseeing the work, Ayiti Kale Je has risen to become Haiti’s principal watchdog effort, putting out 24 reports since it launched. All of the investigations are published as text in English as well as French, and almost are all accompanied by a Haitian Creole audio version that goes to over three dozen radio stations across the country. The consortium has also produced ten video documentaries which have been seen by tens of thousands on line and at screenings or on local television stations throughout Haiti. Staff and volunteers give journalism and “humanitarian industry” workshops throughout the country as well as at Haiti’s State University. Ayiti Kale Je work has been carried by newspapers, radio stations and websites across Haiti and across the world, including Haïti Liberté, Le Nouvelliste, Truth Out, The Guardian and Inter Press Service, and on Free Speech Radio News, Democracy Now! and Al Jazeera English. The partnership has also attracted the attention of Reuters, Investigative Reporters and Editors, and numerous other media organizations. Ayiti Kale Je needs your support! The effort is supported by foundation grants but these have almost given out. No gift is too small. US$30 will cover telephone costs for a reporter for one month. US$100 will pay the office Internet for a month. US $1,000 will pay a student intern’s stipend for five months. Budget and list of funders available on request. Welcome to the econsumer.gov Shopping Assistant. Click “Yes” or “No” in response to the questions in the Shopping Assistant against information you find on the business’s website. When you have answered all seven questions, click “Submit”. The Shopping Assistant will respond with information to help you in making a decision whether to proceed with ordering from this business. Call it up once you are on a merchant’s website. On Internet Explorer click on “Favorites” and on Netscape click on “Bookmarks” to access your list of bookmarks. If required, a text version of the On-line Shopping Assistant is available. On April 24, 2001, responding to the challenges of multinational Internet fraud, and working to enhance consumer protection and consumer confidence in e-commerce, thirteen countries unveiled econsumer.gov, a joint effort to gather and share cross-border e-commerce complaints. The project has two components: a multilingual public Web site, and a government, password-protected Web site. The public site provides general information about consumer protection in all countries that belong to the ICPEN (International Consumer Protection Enforcement Network), contact information for consumer protection authorities in those countries, and an online complaint form. All information is available in English, French, German, and Spanish. Using the existing Consumer Sentinel network (a database of consumer complaint data and other investigative information operated by the U.S. Federal Trade Commission), the incoming complaints will be shared through the government Web site with participating consumer protection law enforcers.